Check out this gently-used 2007 GMC Yukon XL Denali we recently got in. How to protect your purchase? CARFAX BuyBack Guarantee got you covered. This versatile SUV is perfect for families or contractors with its oversized cargo area, exceptional horsepower and option upgrades. Is it possible to fall in love with a vehicle? It is when your vehicle is as prestige as the GMC Yukon XL Denali. 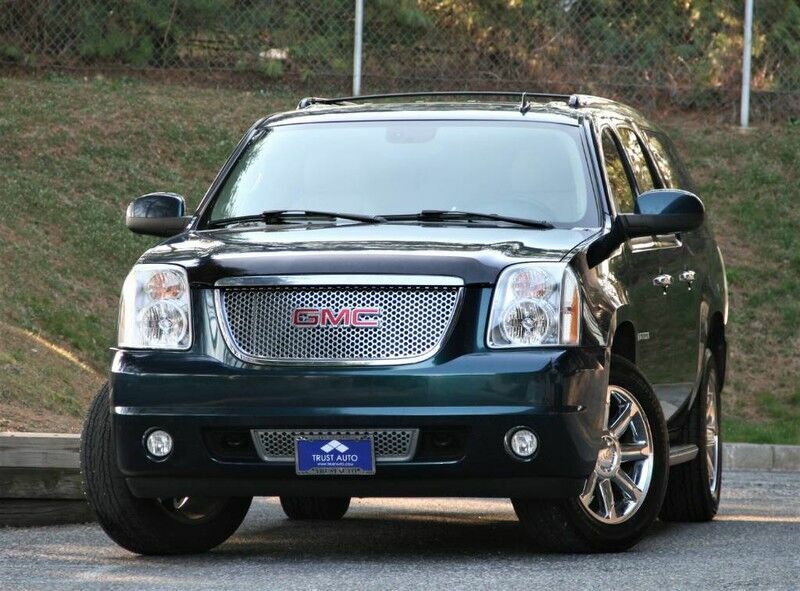 Few vehicles can match the safety and comfort of this AWD GMC Yukon XL Denali . With enhanced performance, refined interior and exceptional fuel efficiency, this AWD GMC is in a class of its own. It's not a misprint. And the odometer isn't broken. This is a very low mileage GMC Yukon XL Denali. A rare find these days. Intricately stitched leather and ergonomic design seats are among the details in which test drivers say that GMC Yukon XL Denali is in a league of its own With complete historical records, you'll know your next pre-owned vehicle, like this one, inside and out before you purchase it. If not for a few miles on the odometer you would be hard-pressed to know this 2007 GMC Yukon XL Denali is a pre-owned vehicle. More information about the 2007 GMC Yukon XL Denali: GMC's 2007 Yukon lineup offers a terrific diversity of comfortable large and extra-large luxury SUVs. Nine passengers can be comfortably accommodated, and the Yukon XL has a tremendous amount of cargo space, even with all of the seats filled. The Yukon is also able to tow up to 8,200 pounds and has a payload capacity of nearly a ton, meaning buyers don't have to choose between utility and luxury. The new interiors are absolutely the top of the class, and will send many of the competitors back to the drawing board. And while the Yukon is lavishly trimmed inside, the Denali is even more so, with heated seats in the first and second rows, power pedals, rear parking assist, dual-zone automatic climate control, and a six-CD changer all standard. Interesting features of this model are comfortable ride, seats up to nine and tows up to 8,200 pounds., lots of features, and Luxury *30 DAYS / 1000 MILES POWER-TRAIN WARRANTY INCLUDED (ENGINE, TRANSMISSION, DIFFERENTIALS)* *TRADE INS ARE WELCOME* Trust Auto is one of the top pre-owned vehicle dealer in Maryland. We provide quality vehicles of various makes and models with the most competitive prices in the region. Trust Auto is dedicated to make your vehicle shopping experience hassle free and straight forward. With that in mind we fully inspect, service and detail all cars in the lot. We are open 6 days a week now FOR YOU!!! Monday - Saturday 9am - 7pm. Some vehicle information and pricing may be unintentionally missing or inaccurate, and Trust Auto will endeavor to correct such discrepancies in a commercially reasonable manner after being notified of any errors. Pricing errors and listing errors are considered invalid and may not be honored at the sole discretion of Trust Auto. Prices subject to change without notice and do not include Title, License, Registration Fees, State or Local Taxes, $895 PDI & $299 Dealer Processing Fees. Please contact seller for vehicle availability. All vehicles with PDI are sold with a 30 day / 1,000 mile warranty! EPA mileage estimates are provided for comparison purposes only. Actual mileage may vary depending on driving conditions, driving habits, and vehicle maintenance. Mileage listings are estimates and are not necessarily accurate odometer readings. Trailering equipment heavy-duty includes trailering hitch platform 7-wire harness with independent fused trailering circuits mated to a 7-way sealed connector (VR4) 2" trailering receiver and electric brake controller jumper harness.